As a new semester begins at the UC Berkeley School of Law, former dean Sujit Choudhry returns to the school for the first time since news broke that a campus investigation found he had violated university sexual misconduct policy, attracting criticism from students and faculty members alike. About 40 students and community members gathered on Sproul Plaza on Wednesday afternoon and later marched through the Berkeley Law campus protesting Choudhry’s return, as well as the publication of an open letter written by Choudhry in The Daily Californian’s opinion section Tuesday. “I don’t want to feel unsafe walking down a hallway to a classroom,” said Axenya Kachen, a campus senior who organized the protest. Choudhry returned to campus as a professor Aug. 31, according to interim Berkeley Law Dean Melissa Murray. Choudhry resigned in March after his executive assistant, Tyann Sorrell, sued him for sexual harassment. 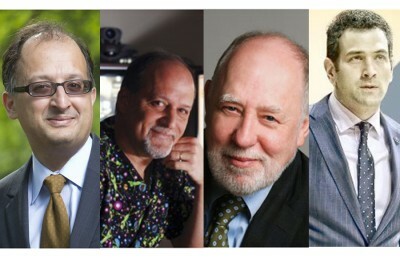 The campus Title IX office found in 2015 that Choudhry had repeatedly given unwanted kisses, hugs and caresses multiple times per week to Sorrell from September 2014 — when Choudhry took over as dean — to March 2015. Choudhry admitted to the misconduct during the campus investigation. Both Choudhry and Murray have stated that the ban was never enforced in the spring, even though Choudhry never attempted to return to the campus at that time, according to campus spokesperson Dan Mogulof. “The chancellor didn’t do anything (to enforce the ban),” Murray alleged. Choudhry’s lawyer William Taylor also said that to his knowledge, Choudhry was not on campus after his resignation. He said, however, that Choudhry’s decision to remain off campus was because of the second disciplinary process brought against him after the sexual misconduct allegations came to light. On Tuesday, the Daily Cal published an open letter written by Choudhry in which he addressed the lack of sexual intent in his past actions and expressed his remorse for the position in which he put Sorrell, while also asking for people to leave him to peacefully do his work. 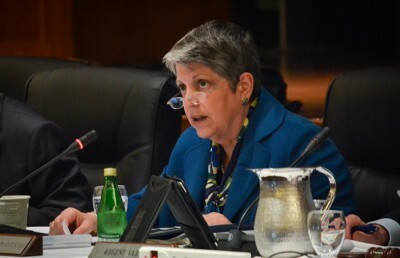 In a March interview with the Daily Cal, Sorrell said she decided to file the lawsuit not only because the sexual harassment she endured was physically and emotionally scarring but also because she became disillusioned by the unsatisfactory response to her case from several campus administrators. “In his op-ed piece (Choudhry) continues to blame the victim for his ‘ills’ which is further evidence that he does not understand sexual harassment or the fact that his own actions are the cause of any consequences he has felt,” said Leslie Levy, Sorrell’s lawyer, in an email. 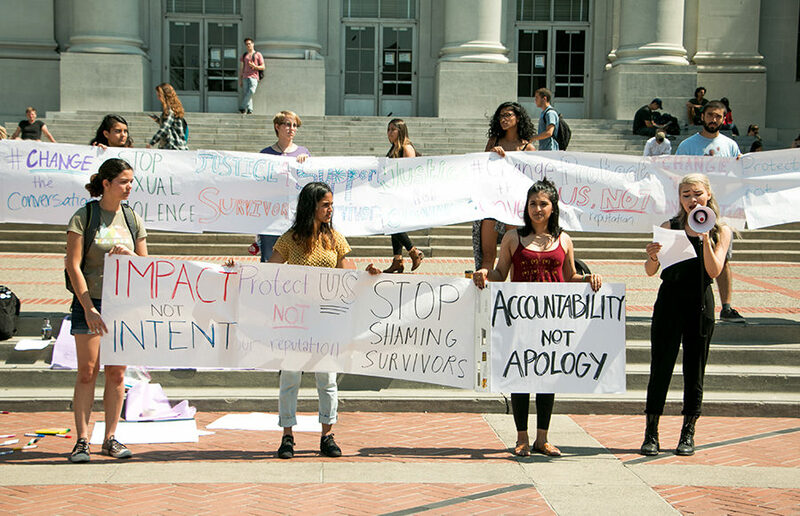 Thanh Bercher, campus senior and former assistant director of the ASUC sexual assault commission, criticized the publication of Choudhry’s letter by the Daily Cal. Senior editors from the Daily Cal addressed the publication of Choudhry’s letter in an editors’ note published Tuesday night. “The publication of others’ beliefs, however — even those that are unpopular and contentious — is fundamental to a multifaceted dialogue on pressing matters related to the campus and city,” the note said. The student protest assembled at noon on the steps of Sproul Hall, where protesters held white and purple signs reading “Justice 4 Survivors” and “Stop Sexual Violence.” As throngs of students passed through Sproul Plaza, organizers called for people to join the protest via megaphone. Protesters repeatedly alleged that Choudhry was found guilty of sexual assault. While Choudhry has never been found guilty of sexual assault, the campus Title IX office found that he did violate university sexual harassment policies. When protesters reached Boalt Hall, the main law school building, they began to march through the halls. While some law students in class only poked their heads out of rooms to see the commotion, others joined in. First-year law student Djenab Conde watched the protest as it came through the law school. Murray directed protesters to the school’s outdoor plaza to avoid disturbing more classes and avoid potential police intervention, before talking with the protest organizers. In March, dozens of Berkeley Law students gathered to show their solidarity during Admitted Students Weekend. 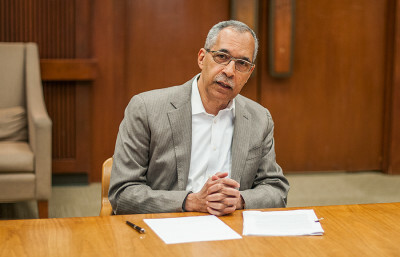 During the protest, Murray pointed to resources developed by the school, such as a new website that directs students, staff and faculty members to resources for getting help regarding sexual misconduct. Kachen said she was unsatisfied with Murray’s conversation and pledged to continue to disrupt the school. “This is not the last of us,” Kachen said. After their conversation with Murray, the protest organizers left to join the rest of the protesters as they began to march through Simon Hall, an eight-story tower that houses many law faculty offices — including Choudhry’s. Choudhry will not teach any courses this year, according to an email from UC Office of the President press secretary Steve Montiel. He added that Murray will identify and supervise Choudhry’s nonteaching duties.